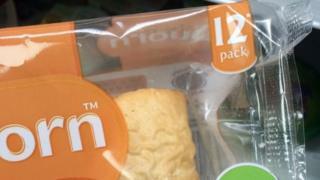 Meat substitute company Quorn Foods will change its sausage roll packaging after a Twitter complaint was shared tens of thousands of times. Dan Douglas drew attention to an asterisk on a packet of 12 of the meat substitute snacks at a supermarket in Sydenham, London. Following the asterisk, he pointed out the pack contained three sausage rolls which the labelling recommended could be served as "12 mini rolls when cut into 4's." "Have you ever seen anything so brazen?" asked Mr Douglas in a tweet along with a series of photos on Saturday. By Wednesday lunchtime, the post had almost 25,000 thousand retweets, more than 52,000 likes, and a response from the manufacturer. The tweet quickly began gaining traction as others agreed the labelling was confusing. Quorn's reply acknowledged the problem and addressed the language used in the tweet by Mr Douglas. A spokesperson for the company told the BBC: "Having seen the comments from consumers over the weekend, we agree that the product descriptor has the potential to cause confusion. "We therefore plan to change the descriptor when we next print the packaging in the New Year."